The new Ryson Wide Trak Spiral Conveyor is in response to our customers’ need to handle bigger loads and reach higher elevations. 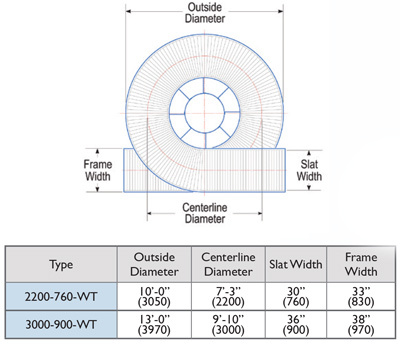 These spirals can handle a variety of load sizes, big and small with their 30” or 36” wide slats. 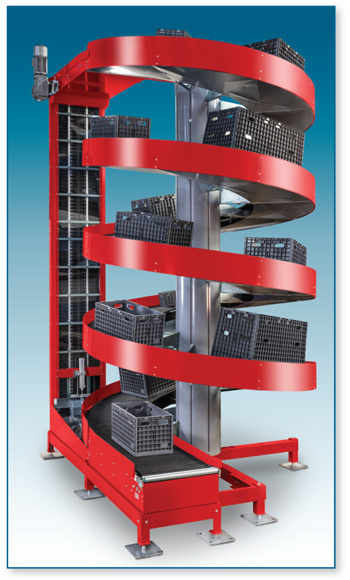 The Wide Trak Spiral Conveyor can handle double the weight capacity of our standard spirals, and can provide an elevation change of up to 50 feet with only one drive. They are ideal for warehousing and order picking operations. The Wide Trak Spirals can also optionally be configured to allow loads to enter and exit the spirals at several intermediate elevations. New special induction and divert conveyors have individually adjustable conveying surfaces to match the spiral pitch, assuring a safe and reliable product transfer. See our Multiple Entry and Exit Spirals page for more information. Click to see examples of Wide Trak applications on our weekly blog. Our in novative modular design can be customized with ease or be modified economically in the field to accommodate changing needs. All spirals are made to order and are available in 4 basic configurations ( A, B, C and D), accommodating most requirements relating to the location of the in and out feed tangents. All configurations can operate up or down in a clockwise or counterclockwise rotation and can optionally be reversible. The position and length of the in feed tangent on up spirals and out feed tangent on down spirals can be customized to meet specific layout requirements. Samples A-EX, B-MA and C-EX are shown. 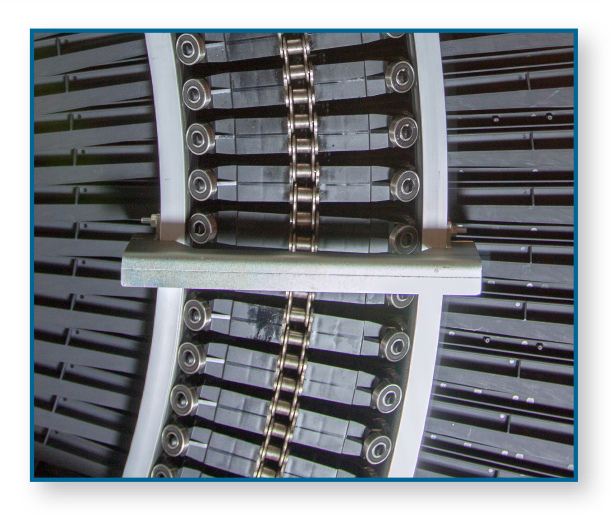 This innovative belt enables a low rolling friction operation without any sliding movements or wear strips. The belt is pulled by a heavy duty steel roller chain and the slats are supported by precision steel roller bearings which ride on a polyurethane surface. This arrangement effectively takes up the side forces created by a tight radius and at the same time increases the load carrying capacity of the belt up to 75 lbs per linear foot. This enables the spirals to start and stop fully loaded and can run at speeds up to 200 fpm. The slats are overlapping and provide a reliable and safe conveying surface.The slats can also be furnished with friction inserts when additional grip is required. 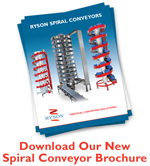 Download the information on the Ryson Wide Trak Spiral Conveyor here. There are many features. benefits and options to the Ryson Spiral Conveyors. Read more about them on our Spiral Conveyor Page, or download our Spiral Conveyor Brochure. For more details on the Ryson Vertical Conveyor, please visit our Ryson YouTube Channel, or read current news and installation stories on the Ryson Blog. Most of our Spiral Conveyors are shipped without controls because they normally integrate with an overall conveyor control system. Our spirals always include an inverter duty gear motor and two proximity sensors, one for the automatic chain tensioner and one for the overload protection device. We also offer a number of controls and pre-wiring options. A Variable Frequency Drive (VFD) is required for proper operation of the spirals. All Ryson Spirals are thoroughly shop tested prior to shipment, but depend on proper integration with the overall conveyor system for optimum performance. Read about our Integration instructions. Click here to see videos of spiral conveyor applications.